The Crimson picked up its first standings point of the season in Saturday's 4-4 draw with a ranked Princeton squad featuring two of the top scoring wingers in the country. 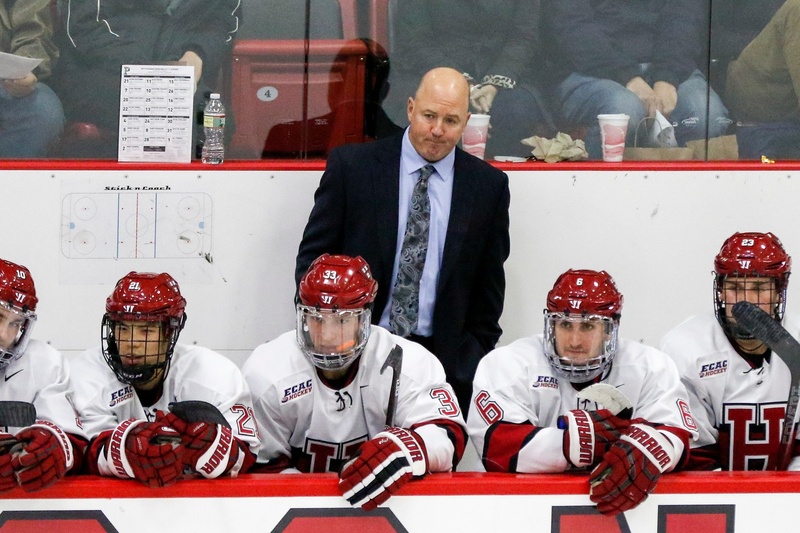 The Harvard men’s hockey team entered Saturday’s contest against No. 19 Princeton having won the squads’ previous 10 matchups. The winning streak is no more, but a point streak of 14 games lives on after 65 minutes of hockey ended in the two teams tied at 4-4. 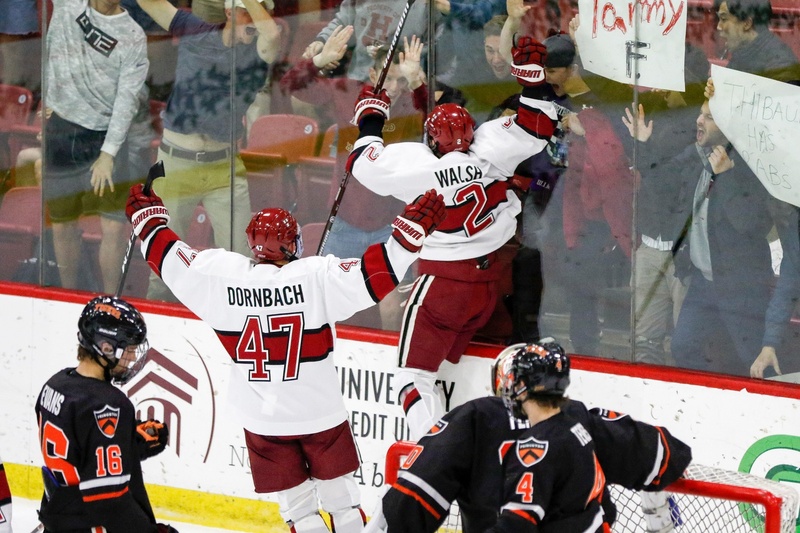 The Crimson (0-2-1, 0-1-1 ECAC) has not lost outright to the Tigers (1-1-1, 1-0-1) since 2011. For the Harvard icemen, learning how to avoid beating themselves is as crucial as figuring out the other team. This trope has persisted since early last season. 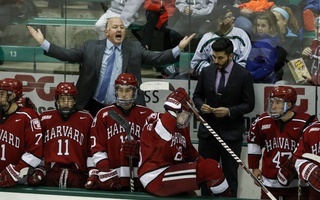 The Ivy League rivals traded goals throughout the first two periods, and Harvard entered the third frame trailing by a goal, still in search of its first notch in the win column in 2018-2019. 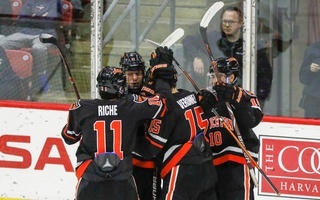 Only two minutes had expired in the final stanza when freshman Jack Rathbone threw a puck toward Princeton goaltender Ryan Ferland. With multiple Crimson skaters jamming at Ferland’s pads, the puck eventually popped out to the left of the crease where freshman Casey Dornbach hammered it home, tying the game at four. Freshman Casey Dornbach potted a third-period goal to tie the game at four goals apiece, where it would finish. 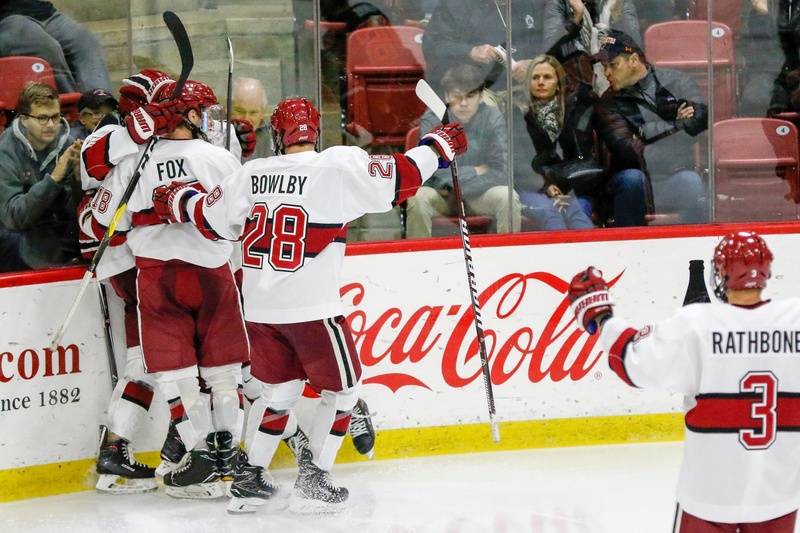 After a staggering five powerplay goals against Dartmouth last week, Harvard’s man-up unit was held off the scoresheet in Friday’s 5-3 loss to Quinnipiac. 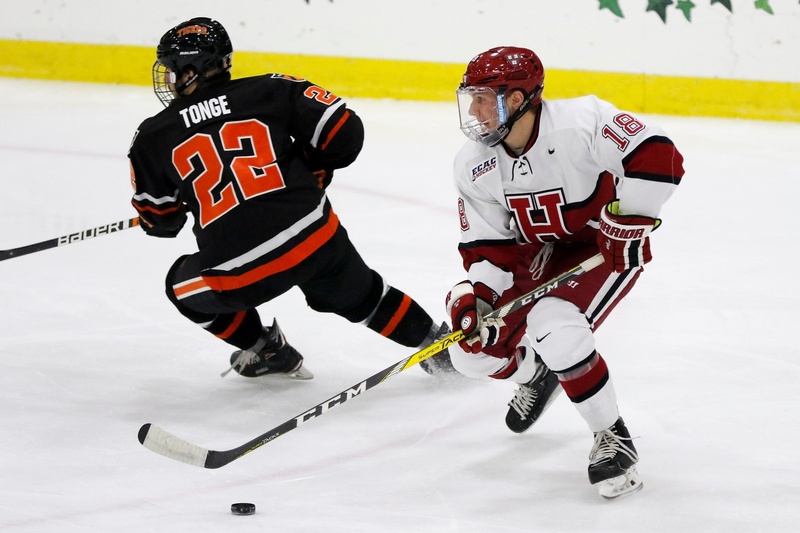 In the second period on Saturday, the Crimson once again produced on the man-advantage, as blue-liners Adam Fox and Reilly Walsh reminded fans, coaches, and players alike how dangerous they are in the offensive zone. Fox began the sequence, receiving the puck at the middle point and toe-dragging his way around a helpless defender. With all eyes on the junior’s dazzling hands, Fox dished a backhand pass to an open Dornbach, who found Walsh on a low-to-high pass through traffic. The sophomore ripped a shot that skimmed freshman Jack Drury on its way to the back of the net. Despite the successful Crimson powerplay opportunity, a Princeton shorthanded goal from junior defenseman Derek Topatigh netted out the Drury score mere minutes later. Overall, the Tigers ran away with the special teams battle, as alternate captain Ryan Kuffner potted his second man-up goal of the night — an in-close redirect off the heel of his stick blade, eerily similar to his first — after Topatigh’s tying strike. For the Crimson, the trend of untimely goals against — particularly at the beginning of periods — continued on Saturday night. Less than four minutes into the tilt, Princeton senior Max Véronneau gained possession of the puck off a center-ice faceoff. The alternate captain ripped a shot along the ice and beat senior net-minder Michael Lackey five-hole. 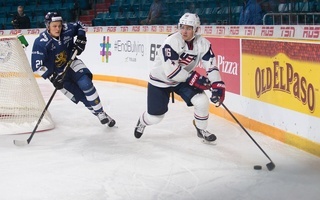 Véronneau, always an offensive threat, finished with four points (1–3—4) on the evening. Sophomore defenseman Reilly Walsh's point-shot powerplay goal was ultimately awarded to freshman Jack Drury, whom the puck skimmed on the way into the net. Unlike Friday’s contest, in which Harvard found itself in a multi-goal hole early on, the home team was able to notch the score less than two minutes after the Tigers tally, tilting the ice back to neutral. Sophomore Jack Badini took the puck around the back of the cage before dishing to Rathbone at the point. The rookie fired a one-timer through traffic and found twine. 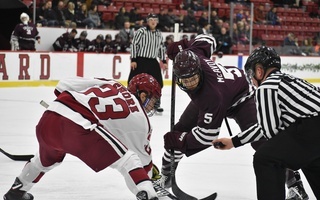 Not only did the Crimson even the ledger, but two minutes later it seized control of the game thanks to a hard drive to the net from sophomore forward Henry Bowlby. Ultimately, the opening period finished tied at two goals after Kuffner struck on the power play, but importantly, coach Donato’s group showed resiliency after allowing an early goal. Princeton alternate captain Ryan Kuffner sent two pucks over the left shoulder of Harvard net-minder Michael Lackey on the powerplay. Saturday night saw Lackey regain his spot between the pipes after coach Donato, dissatisfied by Lackey’s seven goals allowed last week, gave the nod to junior Cameron Gornet on Friday. While his numbers (4 GA, .826 SV%) may not jump off the page, the senior backstop kept his team in the game and showed bursts of promising net-minding. 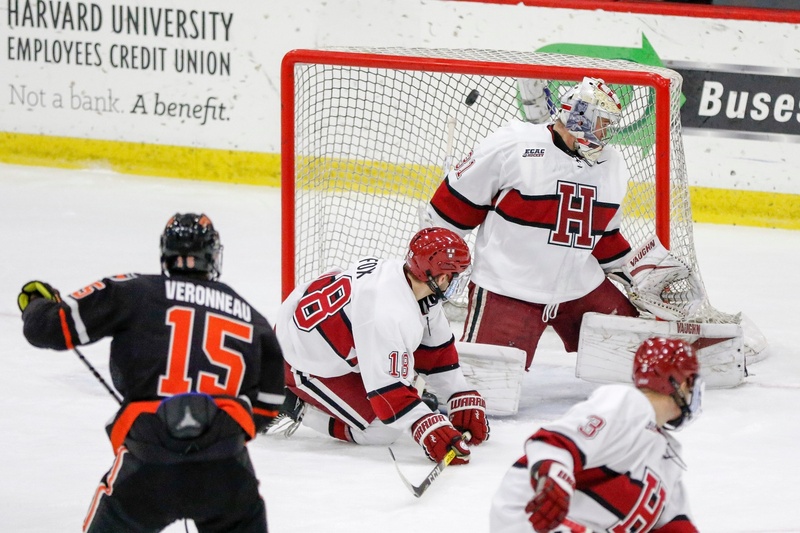 Harvard’s goaltending situation will continue to develop as the season progresses, with the starting role very much still up for grabs while the goals against remain abundant. Two freshmen, Drury (1–1—2 tonight) and Dornbach (1–2—3), netted their first career goals on Saturday night. Another rookie, Rathbone (1–2—3), added to his productive weekend with a strike of his own. In total, freshmen accounted for eight of the Crimson’s 12 points on the scoresheet and three of the team’s four tallies. Prior to the tilt, coach Donato jumbled the lines quite significantly but left the pairing of Bowlby, Drury, and Dornbach from Friday night intact. The early chemistry starting to form between the trio will be key in establishing Harvard’s ideal line combinations moving forward.